Saving up for a vacation can be hard. Hotels are expensive and keeping the whole family entertained for an entire weekend adds up quick, but a trip to the Great Smoky Mountains is not only a blast for the whole group but also surprisingly affordable! From discounted rates to seasonal specials and even free attractions tickets, read our helpful guide on the top 3 ways to save at our 3 bedroom cabins in Gatlinburg Tennessee! One of the easiest ways to save money at our 3 bedroom cabins in Gatlinburg Tennessee is to call up a few of your closest friends and invite them along for a fun filled weekend in the Smokies! A trip to the mountains with your friends is a great way to escape the stress of daily life while also reconnecting with some of your favorite people. Our cabins are conveniently located near all the best Gatlinburg TN attractions, including Dollywood and the Titanic Museum, so there’s always something fun for everyone in your group just a short drive away! The living room in your cabin, as well as the outdoor space, is large and roomy, making it a comfortable place for everyone to gather together for good conversation and company, and the bedrooms are private and peaceful for when you need a few minutes to yourself. We guarantee that you and your group will have a wonderful time reconnecting in the Smokies, not to mention you’ll save a lot of money by splitting the cost of the cabin among a few friends! Another great way to stretch your budget during your vacation to our 3 bedroom cabins in Gatlinburg Tennessee is to take advantage of our seasonal specials and savings! We want you to have the best vacation possible, so we always make sure to have plenty of great options to help you make the most of your money. If you’re a member of a special membership group such as AARP or if you’re a repeat customer, we have discounted rates available for you all year long. We also proudly offer special rates for all members of the military! Last but not least, we always have wonderful seasonal deals that change through the year to celebrate all the beautiful seasons in the Smokies! To help you see and experience even more of Gatlinburg TN, we offer free tickets to a few of the area’s most fun attractions, including things like horseback riding and zipline adventures! 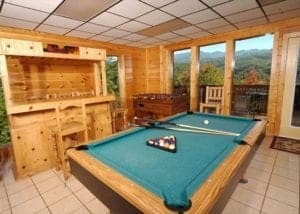 When you stay in our 3 bedroom cabins in Gatlinburg TN, we do everything we can do give you not only the most comfortable stay but also the most fun on the town! A great way to not only save money but also get the best cabin experience is to spend your whole trip enjoying everything that our 3 bedroom cabins in Gatlinburg Tennessee have to offer! Our cabins are set up with all the greatest amenities and extras, so you’ll easily stay entertained all weekend long without ever getting in your car. Your kids will have a blast playing games of pool, air hockey and foosball in your cabin’s game room, and the whole family will love watching movies on the “big screen” in the theater room! While the kids play games and watch movies, the adults will indulge in an evening of relaxation soaking in the hot tub and curling up around a crackling fire. All of our cabins also have large, fully equipped kitchens so you can easily prepare all your family’s favorite foods and save lots of money by not eating out for every meal. From watching the sunrise from your cabin’s deck to stargazing at night from the privacy of your secluded hot tub, every moment you spend in our cabins will be special and memorable. For a vacation as affordable as it is fun, book your stay at our 3 bedroom cabins in Gatlinburg Tennessee today!